Justin Edinburgh is hoping for more of the ‘wow’ factor from the Cobblers supporters when he steps out to manage his first home game in charge of his new club against Coventry City at Sixfields on Saturday (ko 3pm). The former Gillingham boss, who had a watching brief in the Cobblers’ most recent home clash when they lost 2-1 to Scunthorpe United, said when he joined the club that he has always been impressed with the backing the team gets at Sixfields. But he admits the fact that more than 3,000 supporters travelled for last weekend’s defeat at Milton Keynes Dons was a real eye opener for him, and he wants more of the same from the fans as the Sky Blues, who will be backed by a 1,400-strong following of their own, come to town. “I am looking forward to Saturday, and I think I realised the size and potential of this football club when I walked out for kick-off on Saturday, and there were more than 3,000 supporters there for an away game,” said Edinburgh. “That was ‘wow’, and they were fantastic. “They stayed with us when at times they could have quite easily given up on us, but they didn’t and the players responded to that. 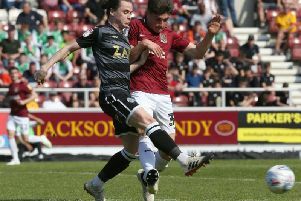 The Cobblers haven’t won a Sky Bet League One game at Sixfields since seeing off Bury 3-2 on October 29, and have now lost five on the spin on home soil. The new Town boss said: “Our home form has not been great and we need to turn that around, because that’s where we have to get things right. The Cobblers go into the clash against Coventry on a five-match losing streak in the league, and having lost 11 of their past 13 matches in all, but the Sky Blues’ record is even worse, as they have picked up just two points out of the past 33 available to them, a run that has seen them drop to the bottom of the table, where they are cut adrift by four points, and are seven points from safety. Former Cobblers assistant boss Russell Slade is the latest man to try his luck at turning the fortunes around at the Ricoh Arena, but he has struggled to date, although he has steered the team to the semi-finals of the Checkatrade Trophy. The Sky Blues, who qualified from the Cobblers’ group, drew 1-1 at Swansea City Under-21s in their quarter-final on Tuesday, but won the penalty shootout. Their reward is a home semi-final against the other team to qualify from Northampton’s group in the competition, Wycombe Wanderers.